Because of the upcoming Dragonrose pattern for an 1867 evening dress, I wanted to explore the fashion of that year. The American Civil War period is very well-explored, and I've done a certain amount of research into the early bustle period, but in between those two, my impression has been comparatively vague. The most common style of bodice for daywear was, as in the previous period, a front-closing one with a jewel neckline and dropped armscye. White collars were still worn: a standing collar inside the neckline, a ruffled collar also inside the neckline, and a turn-down collar with points. Cuffs were made in similar styles, and worn on two-piece coat sleeves of a moderate width; a decorative hanging oversleeve was a fashionable addition for any situation where a long sleeve was appropriate. In evening dress a broad or squared neckline was prevalent, worn with very short sleeves. Images labeled dinner dress often show a squared neckline filled in with a chemisette. At the beginning of the year, the waistline tended to be on the high side of natural; by the end of it, it was a little higher. The most distinctive aspect of fashion in 1867 is the shape of the crinoline. 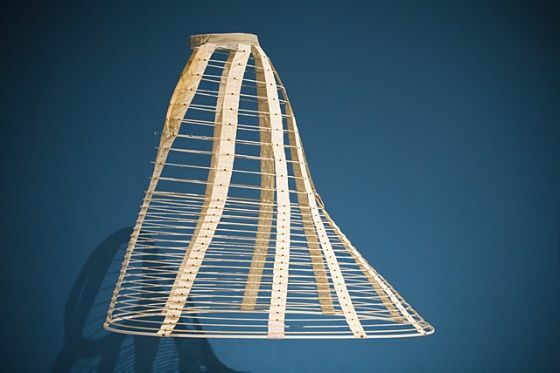 From 1861 through 1866, the fashionable hoop skirt had a large diameter, projecting out in the back and forming something of a straight-sided cone. In 1867, the cone narrowed to a more modest circumference that ran close to the hips, sometimes flaring out into a train. While there were still walking costumes with skirts held off the ground evenly, the fashionable skirt was of roughly the same cut as before - and therefore ended up trailing on the ground when worn over the new crinoline, similar to what would happen in 1876 with the collapse of the bustle. Vertically-striped fabric and vertically-applied trim were fashionably used to accentuate the new narrowness of the skirt. The cut was usually heavily gored, the front and sides attached with minimal pleating and the center back tightly gauged. I originally dated this day gown at the Chapman Museum to 1865-1868, but in retrospect, based on the cut of the skirt and the trim, I would tighten the dates to 1866-1867. Overskirts were beginning to appear but were not very common at this point, and tended to be long. Compared to the Civil War-era styles, hair was worn somewhat high on the back of the head, without coming down onto the neck. Generally, during the day the hair was worn up in a mass with false braids and switches to increase the size; for evening dress, a few long curls might spill down onto the shoulders. Fashionable bonnets and caps likewise were higher up on the head - essentially being flat and resting atop the hairstyle.